To save your file, click on Documents at the top left corner, and then Save. Select a cloud drive, enter a file name at the bottom and then click on Save. The document you are editing is on Xara servers in the cloud. In order to save your created documents you need to make sure you have connected a cloud drive to your Xara Cloud account. When you click Save or type CTRL+S again it saves the document back to your cloud drive. 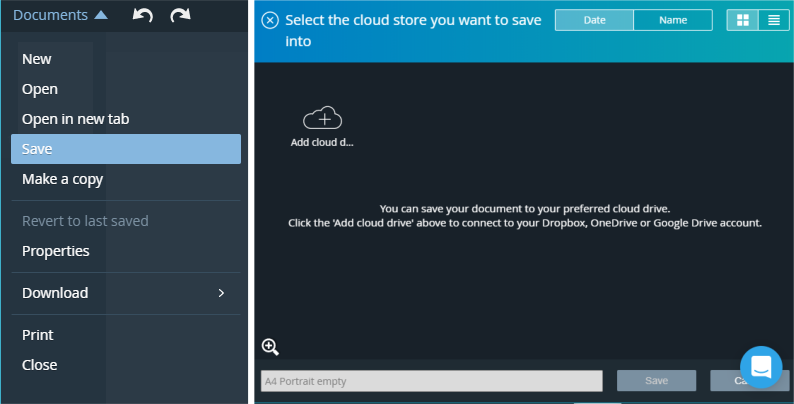 To save your file locally you can run your cloud drive directly on your computer. Your document is then automatically synced back to your cloud drive folder on your computer. The application also auto-saves your document from time to time, so if you would lose the connection to the internet - you won't lose your precious document changes. To save a copy (like Save As) first select Make a copy from this Documents menu. You will see this is called Unsaved on the status line now, which means it hasn’t been saved to any cloud drive. You can also save your documents on your local hard drive by hitting the Download option. Then you can decide if you want to save it on your local machine as a JPEG or PNG image, or PDF document. So this actually works more like an 'Export' option.